I have not found Seraph Sanctuary to be worth it, particularly not when you're running so many Forests. Razorverge Thicket and Windswept Heath are excellent in my experience. You may also consider running Nykthos, Shrine to Nyx , but you do have some non-white devotion, so it may not be worth it. Noble Hierarch is a significant upgrade on Avacyn's Pilgrim , that Exalted keyword can really help, but I understand if you don't want to spend the money. 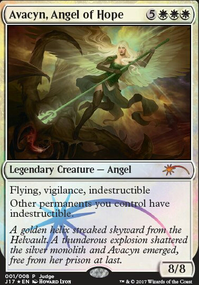 I'd also try and make room for Archangel of Thune , she can really make a difference if you get to swing a few times. Though with her, maybe Seraph Sanctuary would be worth it. For the sideboard, I recommend Leyline of Sanctity and Stony Silence , they do great work. I had a similar deck for a good while you can check out if you're interested: Noble Angels. I'd take Journey to Nowhere over Pacifism , there are a lot of creatures who hurt you just by being on the battlefield without attacking or blocking anyone. 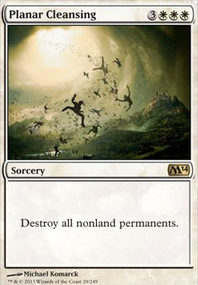 Luminarch Ascension seems like a card that's good in multiplayer where you have a lot of opponents' end phases for it to trigger in and a propensity for stale mates, so if you're playing that way a lot it's a good card. In normal matchups, though, I don't see it doing much for you. 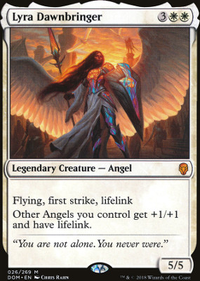 Instead of Ghostly Prison , I'd bring in Archangel of Tithes , she's a bit more expensive for you and not as expensive for your opponent, but she's more versatile and comes with a 3/5 body which can really do wonders. Darksteel Citadel doesn't seem to do a whole lot of good for you, and the occasional life-gain from Seraph Sanctuary is really also something you need to have a payoff for for it to be worth it. Maybe just get some extra plains, or you could get Eiganjo Castle or Okina, Temple to the Grandfathers . You also seem to have rather more forests than I'd really recommend, but good dual lands are expensive, so I get you :) If you can afford them, I recommend Temple Garden , Horizon Canopy , Windswept Heath , Razorverge Thicket and Wooded Bastion . Shaman of Forgotten Ways seems way too expensive, I'd get Birds of Paradise or more Noble Hierarch s if you can afford it, otherwise Avacyn's Pilgrim , Beastcaller Savant or Bloom Tender can do good work too. 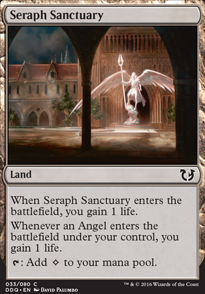 I'm also not sure what Kytheon's Irregulars ' role in your deck is, again let me recommend Archangel of Tithes , or alternatively Angel of Jubilation , Shalai, Voice of Plenty , or Indomitable Archangel or Gisela, the Broken Blade . Baneslayer Angel is a fine card, but unless you're facing demons and dragons regularly, Lyra Dawnbringer is probably better. Her ability to be a lord for other angels is really nice. Iona, Shield of Emeria and Avacyn, Angel of Hope are super powerful bombs, but I'm not sure you have enough ramp to play them consistently. Of course, you know your local meta better than I do, so you be the judge of that yourself :) I'd recommend thinking about dropping them, though. if you run some colorless utility lands, (Field of Ruin and Ghost Quarter are popular to fight tron, which looks to be a really tough matchup for this deck) Moorland Haunt is probably the most budget I can think of, you can run Eldrazi Displacer over the navigator which is massively cheaper on a mana base (I also suggest cutting the leviathans for the same reason, in any modern game vs any quarter decent deck the leviathan is never getting cast without you already having won the game) and is a lot less restrictive in which target you can flicker with it (you can even use it defensively). Oh Guildmages' Forum could be perfect for a colorless land with colored mana option with a utility (that is budget). 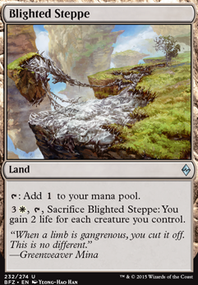 Also Irrigated Farmland is dirt cheap dual land option as well that can even interact with sun titan I would suggest using those over the tapped dual lands (still weird cove is common and river was uncommon in that commander set...) you add dimes to the budget for more effective lands. 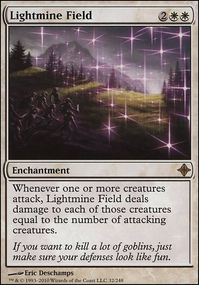 hmm now that I look at it you could probably cut blue all together Militia Bugler and Blade Splicer are both fairly good creatures and you could just increase the count of the various white creatures, Thraben Inspector is also a rather good 1 drop. I think Kitchen Finks got a massive price drop (UMA reprint), Gideon's Lawkeeper is also very similar functioning to a bounce creature, Mangara of Corondor is also rather good with flicker effects. I should stop now... mostly skimming around death and taxes atm anyway now that I think about it.